Waterfront home just 2 houses from the open river. Stylish 3 Bedroom 2 Bath home with Florida Room featuring a stunning picture window. This property embodies a cool mid-century vibe, perfect for entertaining with private gathering areas tucked all around the property. This split plan has been lovingly maintained & updated: impact windows, updated roof and AC, a new seawall & dock and has been freshly painted. 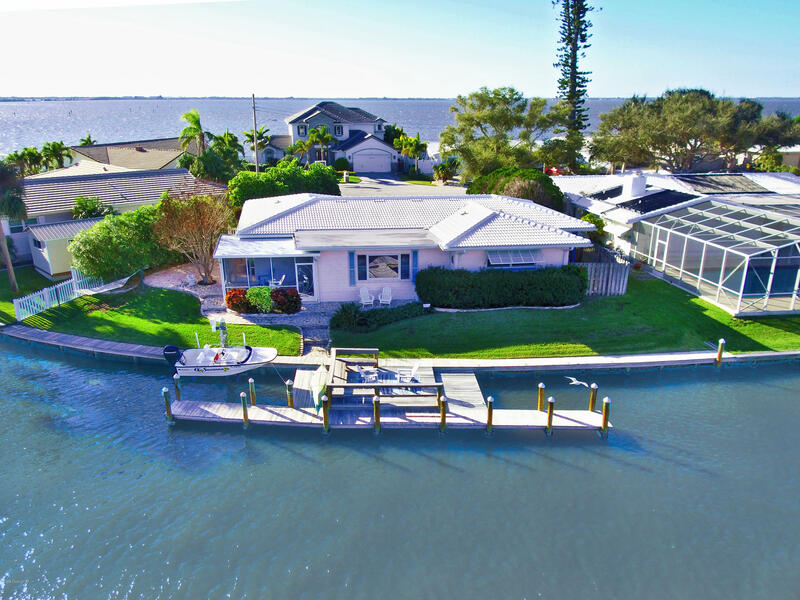 The tropical backyard oasis features a screened patio, hammock, grill area, boat dock with extended platform for easy kayak launch, and a boardwalk that extends the entire waterfront. Safe harbor with dockage for 5 boats. Come visit its little garden 'stairway to heaven'. Desirable cul-de-sac location near the beach, shops, & restaurants. Come experience the beach island lifestyle!